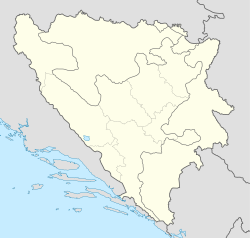 Location of Donji Vakuf within Bosnia and Herzegovina. Donji Vakuf (pronounced [dɔ̂ːɲiː vǎkuf]) (Serbian Cyrillic: Доњи Вакуф) is a town and municipality located in Central Bosnia Canton of the Federation of Bosnia and Herzegovina, an entity of Bosnia and Herzegovina. It was founded by Malkoçoğlu İbrahim Bey in 1572 and was known as "Aşağı Vakıf" ("lower foundation" in Turkish). Donji Vakuf is Bosnian translation of "Aşağı Vakıf". From 1929 to 1941, Donji Vakuf was part of the Vrbas Banovina of the Kingdom of Yugoslavia. The village of Prusac lies just outside Donji Vakuf. Bosniaks make a pilgrimage to the nearby holy site of Ajvatovica in June. It is one of the biggest events in the whole of Bosnia. Wikimedia Commons has media related to Donji Vakuf. This Central Bosnia Canton geography article is a stub. You can help Wikipedia by expanding it. This page was last edited on 9 February 2019, at 13:54 (UTC).